a) Periodical estimation of basin (watershed) wise groundwater resources. b) Delineation of potential groundwater zones. c) Investigation and identification of feasible sites for wells, artificial recharge structures etc.,. 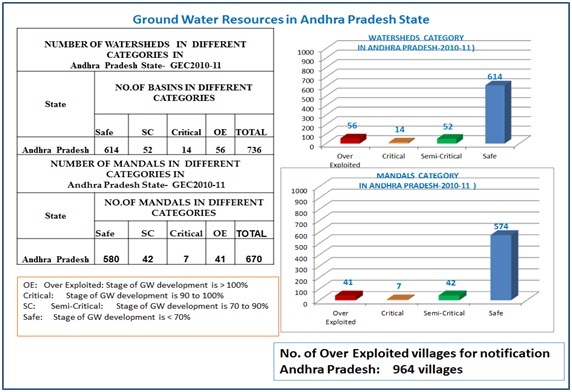 d) Groundwater levels and water quality monitoring through observation wells network (more than 3000 Observation wells, including Piezometers fixed with Digital Water Level Recorders with Telemetry system. e) Exploratory and Production wells drilling. f) Environmental clearances for Industries and Sand mining. 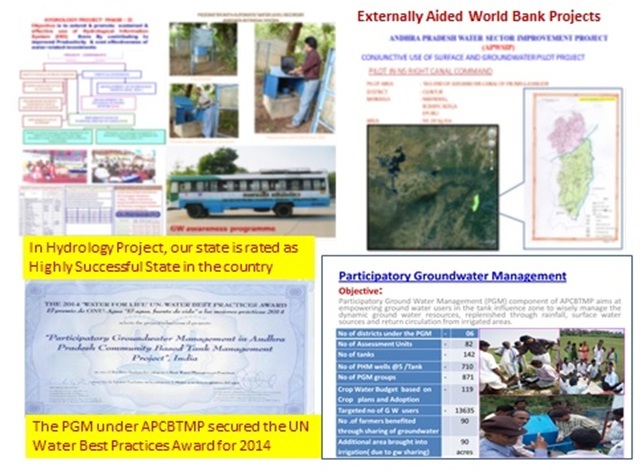 g) Special Groundwater studies using Remote Sensing, GIS etc., tools. 4. Promote conjunctive use of surface and groundwater in command areas to overcome uncertainties in water availability and to increase the irrigated area. 8. 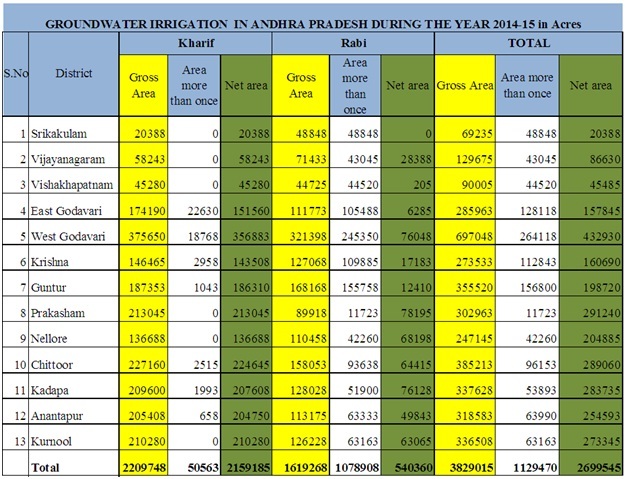 Model for Groundwater levels prediction for monsoon rainfall to take up advance measures during summer months. 9. 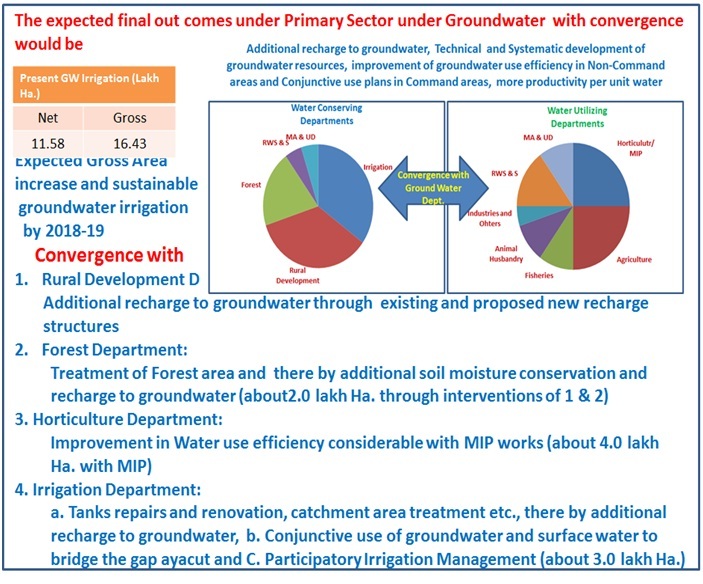 Groundwater development under SCSP and TSP to bring more area under groundwater irrigation. 10. Creating awareness for groundwater sharing as community resource and optimum use for different stake holders. 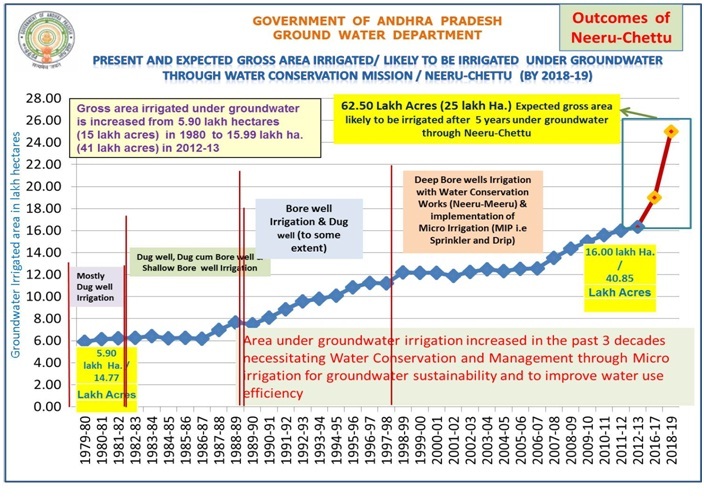 Water Conservation to drought proof the state taking into account the total rainfall, surface flow and groundwater resources by preparing a time bound plan for ridge to valley treatment of basin. The Rural Development, Forest, Development, Irrigation and Ground Water Departments to play major roles in implementing this plan. Water Management to use the conserved water in the most efficient manner by the various development sectors of the Stateâs economy. Agriculture, Animal Husbandry, Horticulture, Fisheries, Rural and Urban Water Supply Departments will play major roles in implementation. The outcomes have to be measured at the end of the five years, evaluated along with the gap analysis for future guidance and improvement of the programme. With the help of existing monitoring network and by establishing new Observation wells wherever required.